The English Verb (affiliate link) by Michael Lewis was one of the most influential books I read during my Delta because it completely changed how I thought about grammar. 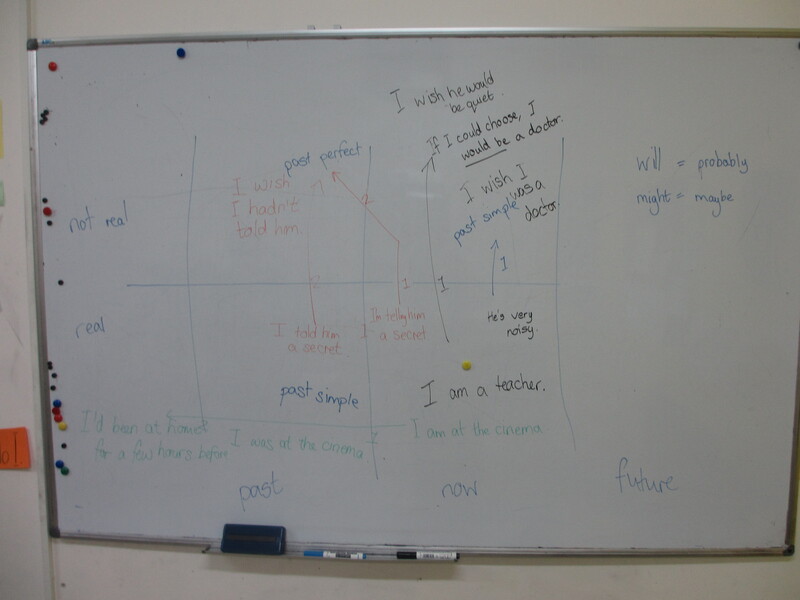 Last week I was teaching my FCE students about tense patterns to express hypothetical meaning and I created this completely unplanned diagram to try to get across the only half-remembered explanations in Lewis’ book about how the past simple, past perfect and ‘would’ really work. Unfortunately, I don’t have a copy the book here to be able to quote anything from the relevant sections for those of you who are unfamiliar with it. The quality of the picture isn’t great either, but hopefully you can see enough to get the idea. The idea is that you start from now/real/present simple, and remove yourself one step away either in time (present -> past), or in imagination (real -> imagined) by using the past simple. You can also remove yourself one step in imagination (real -> imagined) by using ‘would’. To remove yourself two steps away, you use ‘past perfect’, i.e. two steps back in time, or one step in imagination + one step in time. It’s not the best diagram ever produced, but the students seemed to understand a little. In hindsight, I shouldn’t have included ‘future’ on it, and I should most certainly have planned the visualisation and the example sentences before the lesson! Have you ever tried to visualise Lewis’ description? How did/would you do it? Sandy — I’ll never forget doing something very similar in Poznan with the ‘traditional’ conditionals (1, 2, and 3) which worked out great because the ‘removing’ rule actually makes it easier to understand the effect of mixing conditionals. I used the WB AND the carpet squares in my classroom and took steps in different directions depending on what I was trying to communicate — really helped learners visualize it, and then they did it with each other (using the carpet squares). At their insistence I followed this up the next class or two by breaking down the complete Tense and Aspect system for them. One of the best years ever. Doesn’t work as well with students with North Asian 1st languages, but East Europe languages are similar enough for it to really fly. That sounds brilliant Tom. I’m guessing you’d planned it beforehand? I find that students get a lot out of this way of breaking down the tense and aspect system, but I don’t know how to do it clearly and consistently yet. I’d love to read more about how you did it. maybe you have seen this sight called A Visual Grammar of English the whole site (which I think is a work in progress) is pretty good, for verbs and visualisation see this section http://www.englishideas.org/timetenseanddistance.htm. I haven’t seen that site before. It’s fascinating, and very clear in the descriptions of time, tense and distance. I’ll certainly be sharing it with my students. I have The English Verb and I agree that it’s one of the most insightful books ever written about how the English language actually works. Lewis’s point is that Tense is not the same thing as Time. Time refers to an objective reality whereas tense is a grammatical construct. Technically, tense only refers to morphological changes in the verb form, which is why Lewis argues that there are only two tenses (past and present) rather than 13 or so. The past tense is really about distance (temporal, hypothetical, social) than about time. As your examples show (“I wish I had..”), past time is NOT the defining characteristic of the past tense. Note that Lewis never talks about the ‘past form’ of the verb, or the ‘past participle’ but about the second and third forms. It really does change your perspective when you look at things this way. BTW, I wrote an assignment paper about the T-A-M (Tense-Aspect-Modality) system (with comparative references to Polish) during my MA TESOL. I’d be happy to send you this if you’re interested… good bedtime reading! Thanks for the comment Tim. I’m glad I posted about it, because it’s shown me I need to reread the book and make sure I understand it better! It sounds like you’ve got a very good handle on it. I’ll take a look at The Grammar Book if I can get hold of it. Morning Sandy, just received your blog. Thanks for your ideas. It’s nice to see that someone else also takes photos of their Board work! You will find a pdf copy of Lewis’s “The English Verb” on http://www.scribd.com – a very useful site for finding copies of books. There is a free trial after which you can take out an annual subscription for a very modest fee. I find it very useful particularly when, like yourself, you are away from home and your own library! Have a nice day…. Hi Sandy, I love the idea of the visualization of the tense and aspect. I’ve not actually read the English Verb yet, but have heard many people mention it before. I think I will have to move it to the top of my to-read list. I’ve found that my learners in Korea often have difficulty in understanding the ‘distance’ use of the past verb. Once I’ve read the book, maybe I’ll do something similar. Thanks for sharing.